This unique race takes riders 100k out and back on gorgeous Ranch Road 2810. Wide open space, endless deep blue skies, cacti, mesquite and prairie grasses, cool dry breezes, occasional road runners and box turtles. A little slice of heaven. 3 water and snack stations along with medic and mechanic support are provided along with post race meal. Registration packet pick-up Friday, Oct. 20, 5-8pm and Saturday, Oct. 21, 7-8am at St. George Farmstand. 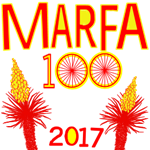 The MARFA100 is a charitable 100km bike race on scenic ranch road FM 2810 held Saturday, October 21 @ 9am in Marfa, Texas. Proceeds benefit The Dixon Water Foundation whose Mimms Ranch Unit in Marfa, provides access to hikers, runners, students, educators, and those interested in practices​ of environmentally and economically sound rangeland management.​ Because of their holistic​ stewardship of this ranchland, ​visitors’ lives are enriched in experiencing the spectacular panorama of the surrounding Chinati and Davis mountains, vast​ grasslands, and​ thriving ecosystem for many plants, animals, and migratory birds. This race is the perfect ride to end the season on the most beautiful road in the world. Riders of all skill levels are invited to come celebrate the purity of the sport. An empty road, endless deep blue skies, rolling grasslands, cool dry breezes, and darting road runners, are just a sampling of what makes this event truly exceptional. Race headquarters will be at St. George Farmstand. There will be three water and snack stations on the route, along with medical and mechanical support. At the awards ceremony, winners of each age category will be honored with engraved Marfa agates provided by Moonlight Gemstones and overall winners will receive a custom designed jersey. A post race meal is provided along with free entry to the evening music event at St. George Hall by Magnifico and Low on High. On Sunday at 10:00 a.m. organizers, participants, and kids can enjoy a Marfa History Bike tour which culminates at the Saint George Farmstand where participants are treated to crepes, fruit and coffee made by Valerie Brevard-Culbertson. Lastly, this event has been made possible in the past by our generous supporters including: Big Bend Sentinel, Big Bend Title, Bike Marfa, Bizarro Bikes, Foodshark, Frama, Get Go, Hotel Paisano, Magic Hour, Marfa National Bank, Marfa Realty, Marfa Table, Marfa Vista Real Estate, Marpho, Ranch Candy, Silla, Stellina, Saint George Hotel, and The Well.